In a way, it’s comical that a simple, common, disposable item such as a pallet could be responsible for creating so much at our little farm. 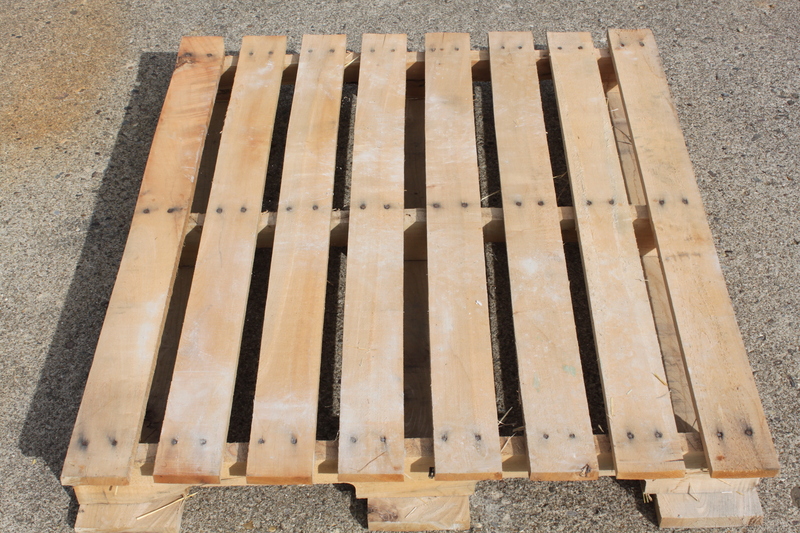 To most, pallets are nothing more than a few pieces of rough-sawn wood, assembled together to provide a stable base for safely shipping items around the world. For us, however, they were the inexpensive building blocks – and paved the way for us to realize the dream of creating our farm. 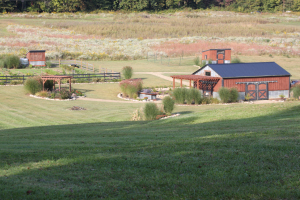 As crazy as it sounds – pallets played a huge role in the building of our little farm. When we first started out – we made a promise to one another that no matter what – we would build the farm on a zero-debt premise. We wanted to simplify our life, not complicate it – and it just didn’t make sense to do that by going in debt to build chicken coops, barns and more. We are both very proud that we have held completely true to that promise – and pallets have played a big role in that! Who knew you could create so much from simple pallets! In fact, the first two structures at the farm – the chicken coop and compost bins were built almost entirely from pallets for free! And from there – it just sort of snowballed. What it really lends truth to is that where there is a will – there is a way. So before the winter ends it frozen lock on our garden, and the chore list starts to mount – we thought we would take this Sunday update to look back at how pallets have played a vital role in the building of Old World Garden Farms. 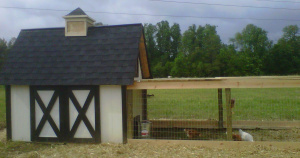 Our chicken coop was the very first “building” on the property. We actually created it in our driveway at home, and then hauled it out to the farm to house our very first flock of chickens. We sided the entire building in shipping crate pallet wood – and used some of the longer crate boards for trimming it all out. At almost zero cost – it was a great way for us to forage into raising chickens without breaking the bank! This past year, as we enlarged the flock – we had to build a larger coop – but we are happy to say it was donated to a nearby farm, where it still holds happy chickens today! 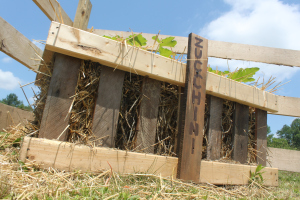 Compost is a key ingredient to the success of our garden – and we started early on making our own in the double compost bins we created from pallet wood. 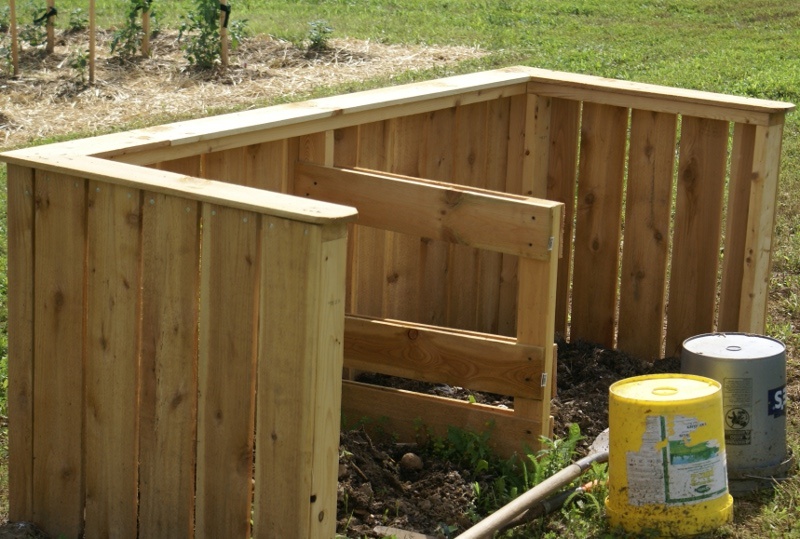 Untreated pallet wood is a great choice for creating the bins – the wood of course is free, and is rough cut – which really allows it to stand up to the elements. The bins have worked really well, and this past spring, we added on a 3rd bin to create even more compost in the coming years. 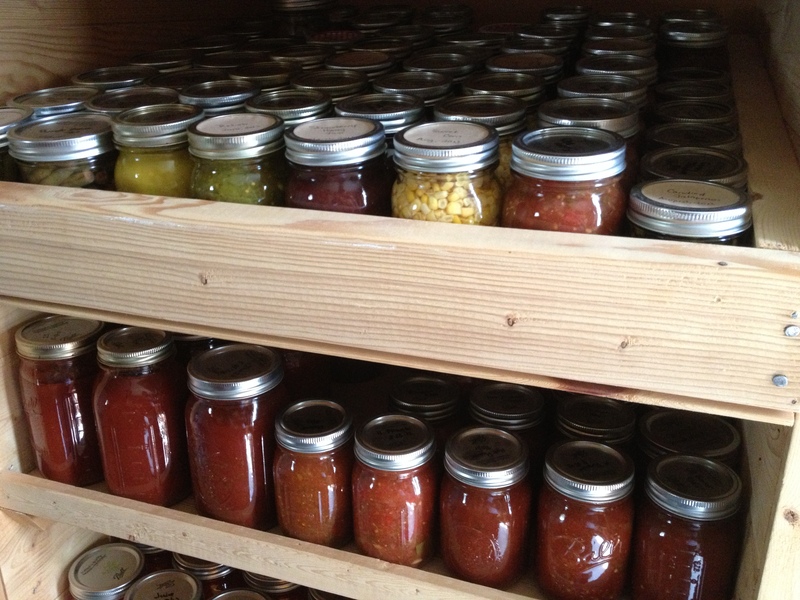 When we needed a place to store all of the canned goods from the garden – we turned to pallets once again! 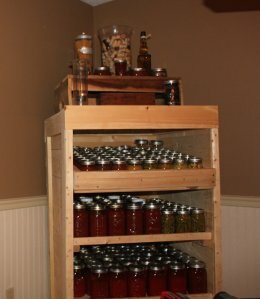 Made from simple shipping crate pallet boards, the canning cabinet (also picture at the top), holds around 200 jars of garden goodness. It’s the perfect size to store a year’s worth of food for our family. It remains to this day the most viewed DIY post on our site, and in fact, after so many asked, we finally put the complete plans for the pantry on our Etsy shop. The mailbox project was truly one of necessity. We realized that people were starting to send mail to the farm – and we needed something quick for the mailman to put it in! So why not make one of pallets? 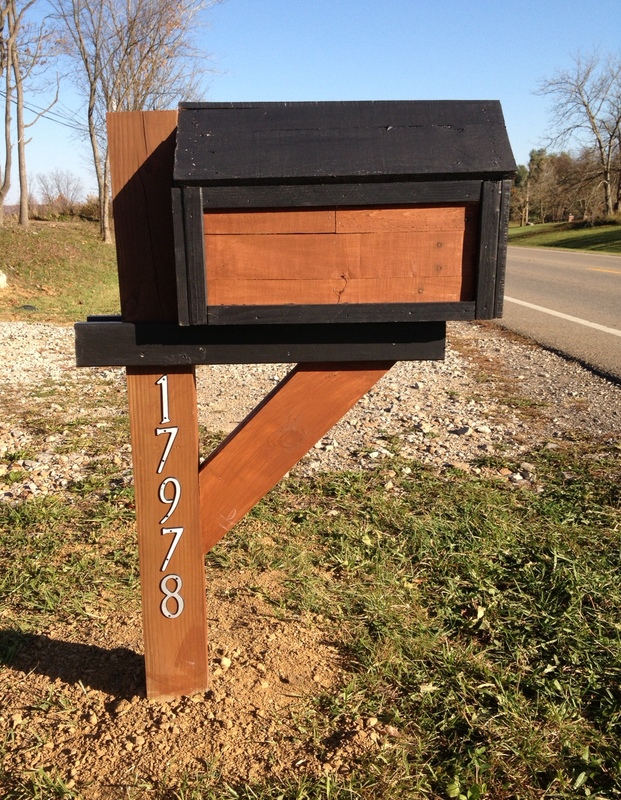 This remains one of my favorite projects of all time – especially since the entire mailbox (minus the post) was made from just a single pallet. It has held up extremely well, and still stands strong today – giving a little inviting clue at the entrance to all of the pallet projects that have become such a part of our farm. As we began to grow more varieties and rows of vegetables – we started to realize we needed some type of markers for the plants – and pallets came to the rescue again! 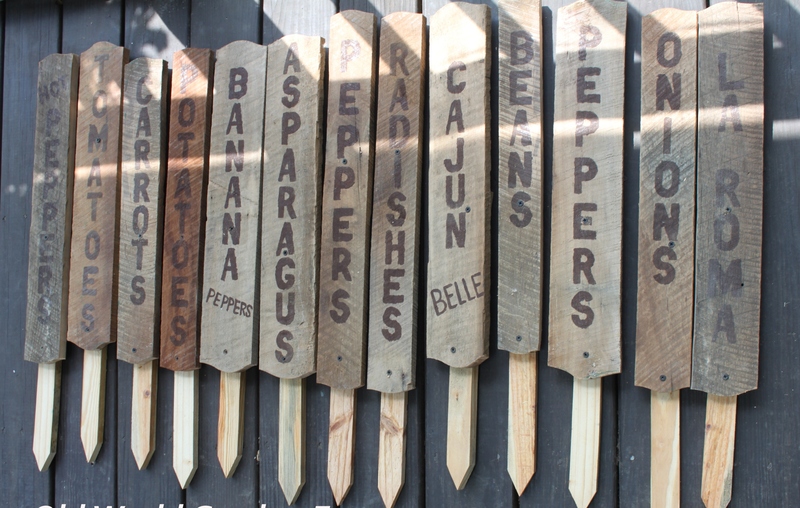 We created the garden markers from old remnants of barn wood and pallets – and the project ended up being one of our top “How-To” posts of last year. Without fail – it is usually one of the first thing visitors notice and ask about when they walk through the garden – and we made them for free! 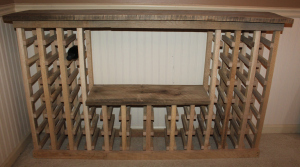 So you might ask – how does the wine rack fit in to a farm? Well, hopefully – if the grapes continue growing, and our small vineyard can mature and start producing a sizable harvest in the coming years – we will need to build plenty more of these racks to store our home-made wine! It was actually an easy build – and using pallets kept the material cost to a minimum.